Blackjack (also known as twenty-one and pontoon) is a gambling card game widely popular among gamers from different countries. Typical game is played with the help of 1-8 standard 52-card decks. This game is played in all casinos throughout the world in different variations and with altered table rules. It is considered that blackjack became so popular due to synthesize of skills, luck and sensation of card counting. Why the game was named "blackjack?" The name refers to the typical French game when the player drew the first 2 cards such as Jack of spades and an Ace of spades and was rewarded with a very attractive bonus. Even the bonus was very soon abolished, the name of the game remained the same. It is commonly assumed that blackjack emerged in France during 17th century. In the early 1700s the game named "Vingt-et-un" (twenty-one) began to accumulate popularity in French casinos. The first record about this game can be seen in the book of Spanish novelist Miguel de Cervantes Saavedra between 1601 and 1602. He was a hope-rider and adored playing gambling games. In his book he writes about experienced cheaters at "Ventiuna" (Spanish word for twenty-one) who worked in Seville. These are evident proofs of the fact that twenty-one was played in Castalia in the early 17th century or even a bit earlier. After the French Revolution the game reached Americans who readily adopted it because of its flexibility and simplicity. American gambling history pushed experienced players to the conclusion that blackjack perfectly fit for manipulating with bets and odds. Lacking proper regulation from the authorities uncontrolled gaming brought to fraud, organized crime and corruption. In 1910 American government made effort and tried to banish gambling. Nevertheless it just went underground. Later on when gambling was partially legalized in the United States blackjack quickly conquered the hearts and minds of players throughout the casinos of Las Vegas, Nevada. In 1978 hazard adventures were also allowed in Atlantic City that is the second largest American gambling resort up to the present days. Blackjack was and still remains very popular and beloved gambling game in Russia. It is typically called "21" here and is played with great passion almost in every casino. 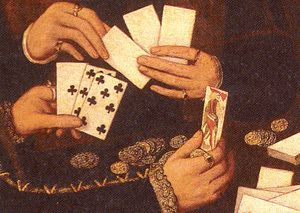 Publicity around card counting techniques is often rendered to blackjack. It is true that a great deal of money and efforts were invested into tracing of the best existing strategies of blackjack. And these endeavors according to the gambling history were crowned with success and resulted in "Basic strategy" for Blackjack written by Roger Baldwin in 1956. Nowadays blackjack is one of the most favorite hazard adventures in many countries of the world including Europe, Russia, the US, Canada, Australia and many other countries of the globe.